A few years ago I took a short, one week trip to a few cities in the southeast of Turkey on a road trip, intending to go from Istanbul to Mardin, Hasankeyf, Diyarbakir, Sanliurfa, and Gaziantep. I got my ticket for the bus, which would depart the next day around 4:00 pm to Mardin. Mardin is about 1,000 miles away from Istanbul, and even by car is a 17 hour journey. Most sane people would choose to fly, especially as Turkey has a lot of cheap airlines. But if I’m traveling around to different cities, I like the feeling of being grounded the whole time. I like being able to look out the window and see the changes in landscape; I like feeling the journey. Flying feels like cheating, in a way. So Friday I got to the bus station at 3:00 and started to wait. Soon it was 4:00 and I knew that my trip was not going according to plan right from the start. Nothing happens on time in Turkey but usually buses leave the station according to schedule, and mine hadn’t shown up yet. I went to the ticket desk and explained that I hadn’t seen my bus. He told me to sit down and he’d sort it out. After a little bit he saw a bus leaving for Diyarbakir and ran outside urging me to hurry, hurry, and he talked to the driver and handed him a wad of cash, instructing him that I was going to Mardin and then I was on the bus. I got on, found a seat, and started talking to the drink/snack service guy, Ilyas. My Turkish wasn’t great and the Diyarbakir accent is a bit thick, but we managed to converse and became buddies. He said that when we got to Sanliurfa that he’d find me another bus to Mardin. At one point in the middle of the night the bus stopped at a station and Ilyas told me to follow him inside, and we sat down with the driver, and they gave me some food and asked me questions. My family, my religion, what was that huge book I was reading and what religion was it. I said it’s a book, it doesn’t adhere to any religion, to which he replied that all books are religious and that there are four kinds of books (I’ve since forgotten), and that I should become a Muslim. As the bus continued its journey I kept having short conversations with Ilyas. It was hard for me to understand what he said but I told him that after Mardin and Hasankeyf, when I came to Diyarbakir, that I’d stay with him and his family and he could show me around the city. I dozed off and awoke at 8am when the bus crossed the Euphrates river and I felt very happy to realize that I had never seen any of this before, and that over the following week I would continue to see things that were completely new to me. It was such a refreshing feeling to the tedium that my life in Istanbul had become. Highlights from the 22 hour bus journey were a strange medical emergency outside the bus at 2am when someone was having something like an epileptic fit; in Sanliurfa when I was supposed to be shuttled off to another bus to Mardin but the other driver wanted too much money so my bus driver told me to just stay on until Diyarbakir (at which point I decided I’d just start my journey there); and nearly being stranded when I went inside to relieve myself and came out to see the bus pulling onto the highway in the distance. Finally we arrived to Diyarbakir and I waited around in the bus station for Ilyas because I thought I’d be crashing with him, but he explained that the bus was leaving again somewhere and that he had to be on it, but put me on a bus to the center of town. On the bus I got talking to a guy called Hatip, who was an art history student. Hatip invited me to drink tea with him so we went and he bought me tea and gave me lots of cigarettes and we talked about family, religion, where I’m from, where I live, what I do, etc. We finished our tea and Hatip put me back on a different bus and I got off in the center and walked around. From my hotel in the center I wandered around the maze of small streets in the old town before realizing that it wasn’t really a good neighborhood to wander around and get lost in. I went and got some dinner and went back to the hotel, exhausted and ready to turn in, but then Ilyas called me. Apparently he hadn’t left the city and wanted me to go to his family’s house. I couldn’t quite manage to understand what he was saying, so I went down to the reception and tried to get their help. I gave the receptionist the phone and he talked to Ilyas for a while and gave the phone back to me and I hung up, realizing after the fact that I may have hung up on Ilyas. No matter, I thought, and proceeded to wait. I assumed he would come to the hotel and get me in about 10 or 15 minutes. Time passed and Ilyas never came, so I went to bed. I wondered if I’d hung up on him the night before and that was why he’d never come. I put the matter out of my head. I got up early the next day and walked around the city walls again, getting pictures I hadn’t felt comfortable taking the afternoon before. It was time for the market in the old town, and the streets were filled with men and boys and motorcycles, bikes, shoes, clothes and trinkets of all kinds. I got some photos, headed back to the hotel, got some breakfast and went to the bus station to go to Batman. Over the next few days I explored the cities of Hasankeyf, Midyat, Mardin, Sanliurfa and Gaziantep. It was too quick a journey, with only one night in most places. It was a quick, whirlwind tour and I really only had enough time in each city to know that I would like to spend more time in each place. Hasankeyf is a lovely town that is doomed to be destroyed by a dam in coming years. In Midyat I went to Mor Gabriel, the oldest Syriac Christian monastery in the world, from 397, built on the remains of a Zoroastrian temple. I stumbled around Mardin for a few days. It’s a beautiful city built into a hill, with great views in every direction. A hightlight from Mardin was another Syriac monastery, Dera Zehferane, built on the site of a former sun temple. It has 365 rooms, one for each day of the year. In Sanliurfa, and saw Golbasi, a pool where legend has it, Nimrod threw Abraham into a fire, and God turned it into a lake. There are lots of holy carp in the lake. From Sanliurfa I took a taxi to Gobeklitepe, the oldest religious site in the world, dating back about 10,000 years old. Information about the site is minimal and excavation is ongoing. From Sanliurfa I took another bus to Gaziantep. By this time, however, I was pretty tired and running out of money, so didn’t do much other than wander around and go to the mosaic museum (which is amazing) and the next day got a bus back to Istanbul. What sticks out in my mind about this whirlwind tour most, though, is my brief friendship with Ilyas. For me I just talked to him on the bus on some long journey. But for him our talks on that bus ride, and our connection became a bond. 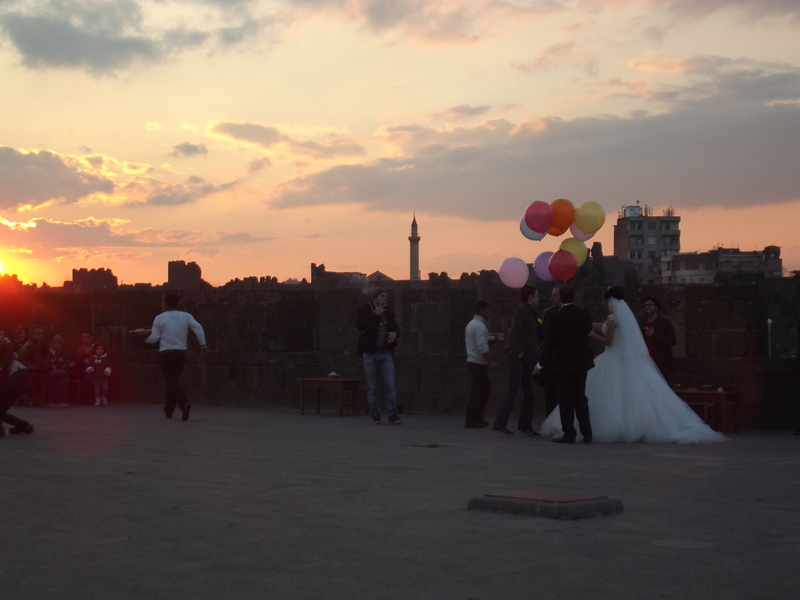 He had called me a few times after I’d left Diyarbakir, wondering when I would go back there to stay with his family. I replied, however, that on this trip, I wasn’t going to be able to make it back to Diyarbakir, that I really didn’t know when I’d be able to make it back. He seemed hurt by this and I think was upset with me that I didn’t go see his family when I was there. He said he’d be in Istanbul in a few days and I told him that maybe it would work out to meet up and drink tea when he came to Istanbul. A few days later I got a message from him that he was in Istanbul, and I was at work, and he wanted to meet up. I responded that I was at work, how long would he be in Istanbul? He said he was leaving in an hour. Over the next few months I continued to get a missed call from him, or he would send me a message every once in a while, sometimes accusing me why I hadn’t been in contact with him, or why I hadn’t asked him how his family was doing or something. Then a few months later it turned into text messages with full stops punctuating them “selam.” After a while I stopped responding. So whenever I think of this journey I took, it just brings to mind Ilyas and how hurt he was that we didn’t become buddies, and part of me feels bad about it.